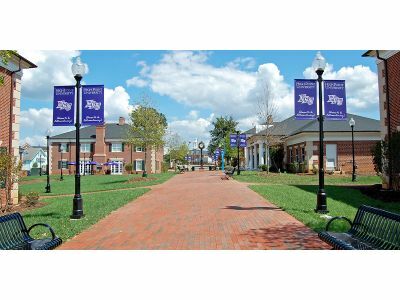 When you choose BannerFlex to decorate your campus, you’re getting the best in the business. Our banner hardware has been wind tested up to 100 miles per hour, meaning no matter where your campus is located, our banners and banner hardware can survive the weather. On the slim chance that any of our hardware is faulty for any reason, we offer a 10-year warranty, so you never have to worry about us failing you. When you’re a new student going onto a campus you’re unfamiliar with, it can be quite intimidating. You want something to be able to identify the place to which you’re going, and banners from BannerFlex can help with this. Whether you display a specific buildings name on the light post outside of it, or even the specific section of campus that you’re in throughout it, students will be able to more easily tell where it is they’re at and where they’re headed. Although your BannerFlex banner and banner hardware will hold strong for many years to come, that doesn’t mean you need to forego style. With one of our sister companies within the Consort company, Kalamazoo Banner Works, you can design custom banners for your campus. With your school’s colors brightly hanging, your new students will have a landmark to look for that will guide them and fill them with school pride at the same time. With over 30 years of experience in banners and banner hardware, BannerFlex brand light pole brackets and other hardware is tried and true. As the first street banner company in the nation to market nationally and internationally, BannerFlex promises that we have the solutions you need.